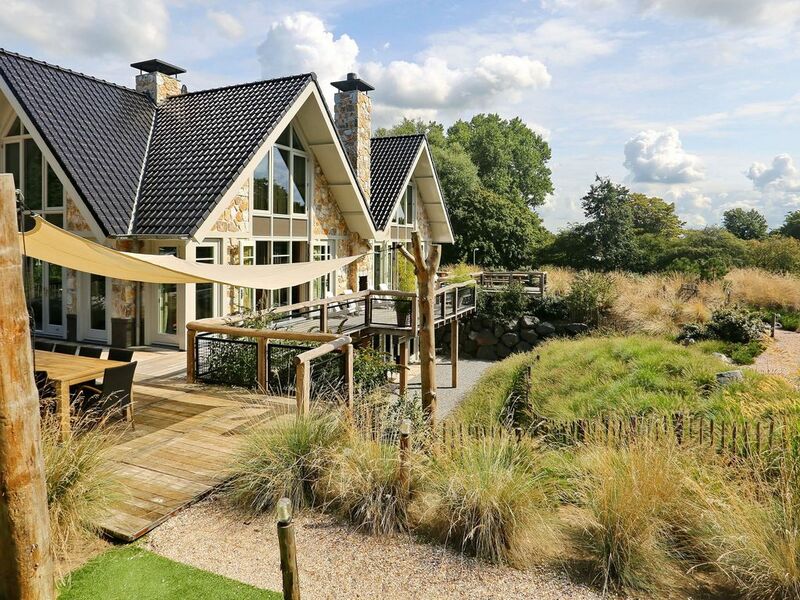 You'll find your holiday home in a unique location in the nature reserve at Noordwijk at Sea, set on a large plot measuring around 3000 m2. The garden offers plenty of space for relaxing in the swimming lake, the sauna, and the jacuzzi. You can enjoy the quiet and the beautiful view from here, and using the forest path beside your holiday home, you can walk to Noordwijk beach in just 15 minutes. Every luxury has been taken into consideration, meaning that all seven bedrooms feature a private bathroom. You can pay an additional supplement for a chef or hostess to make your stay even more pleasant. The holiday villa has been decorated in a sympathetic style, offering you all the space and privacy you need for a relaxing holiday. All modern technology has been deployed to create this energy-neutral group accommodation. You can walk straight into the dunes and towards the sea, and by bike you can explore the entire area. The beach is very close and for groceries you don't have a go far either - in Noordwijkerhout or Noordwijk you'll find everything you need. Cities like Leiden and Haarlem (and also Amsterdam and The Hague) are easily accessible; during the spring time you'll enjoy the exuberant colours of the flower bulb fields. Noordwijk beach is just a stone's throw away, and is the perfect place to enjoy a summer day by the sea or to take a refreshing walk in the winter or autumn. There are plenty of opportunities to explore the mountain biking trails in the local area. On arrival it is possible to ask for an additional fee to have an extra cleaning and extra change of linen.